I have two things to say about John Romero's Christmas present. First, it is glorious, and perfectly appropriate. And second, I am intensely jealous. 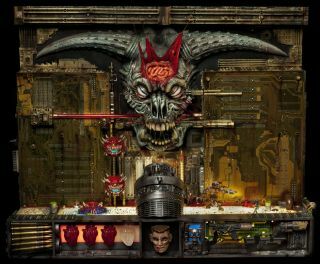 Brenda Romero revealed the gift, a detailed sculpture based on the Doom 2 level Icon of Sin, with a couple of photos on Twitter earlier this week. A closer look at the work and the process of making it can be had at creator Jason Hite's website, where he explains that some of the individual components were built from existing pieces—the Doom Guy is a "slightly augmented' HorrorClix figure—while others, including the central demon skull, are entirely hand-made. Upon completion, the sculpture was sent to the Copro Nason Gallery in Santa Monica, California, where it went on sale for $6000. Hite told Polygon he also sent photos of the work to John Romero, who seemed duly impressed. "A few days later, out of the blue, John messaged me asking if the sculpture was still for sale," he said. "There was one other person who also expressed interest to me but had not confirmed yet, so I told John the sculpture was his!" It isn't completely faithful to the game's famous final level—Hite replaced the numeric indicators with hearts and "possibly live" .30 caliber bullets—but he did make a point of including the most important detail: Romero's decapitated head, stuck on a stick, and hidden out of sight.